This is the 9th week in our Summer of Sci-Fi Challenge. For the complete list of Summer of Sci-Fi books, click here. I really truly don't know why I liked this book so much. It should have been beyond depressing—a post-apocalyptic world in which it appears just a single human called Snowman has survived, with a handful of genetically engineered almost-humans as his only company. That's the makings of a nightmare, and I haven't even mentioned the gene-spliced predatory animals that are on the loose, or the memories of his role in the catastrophe that torment Snowman both waking and sleeping. This is not warm and fuzzy stuff; it's not a summery beach read. I turned 29 last week, and I was a little concerned when scheduling dictated that I would be reading Oryx and Crake on my birthday—wouldn't it be too much of a downer? Who wants to dwell on the ethics and dangers of bioengineering on a day when the fact of one's own inevitable aging is driven home with greeting cards and pastries set ablaze? I needn't have worried. I was forgetting one crucial fact: Margaret Atwood writes like a boss. So here's the rundown: Snowman lives in our world, but it's our world after something terrible has happened. The details of the terrible thing and Snowman's part in it are slowly revealed through periodic flashbacks. In the meantime, Snowman scrapes out a meager existence with the help of the Children of Crake, creatures who are human-like but different somehow. Simpler. There's a lot they don't understand, and they look to Snowman for explanation, most of which he invents. It's clear that Snowman feels responsible for the Crakers, but it's not clear why that is, nor do we fully understand their strange origins until late chapters. Snowman wasn't always called Snowman. Before the catastrophe, he was just Jimmy, and he had a childhood friend named Crake. Crake is exceedingly brilliant and is recruited to work in the most elite Compounds where the latest advancements in biological engineering are made. Everything is a product that can be bought for the right price: new skin when you become wrinkled, new organs grown from livestock when yours wear out, even made-to-order designer babies, pre-screened to eliminate disease and unfavorable characteristics. Crake has a disturbing vision for how the world could be, one that Jimmy doesn't recognize until it's too late to reverse. Oryx is more enigmatic. Jimmy loves her, but he doesn't understand her. She's soft and docile despite years spent in abusive situations. Crake too is fascinated by her and installs her as a vital emissary in his experiment, though the full, tragic scope of her role is unknown even to Oryx until the end. This book is the first in a trilogy, and it's now one of my top priorities to read both The Year of the Flood and MaddAddam. Not because I love and adore post-apocalyptic dystopian crisis-fests, but because Atwood's writing is sure to be glorious despite the weighty subject she's chosen. And also because I know it doesn't hurt to remind myself every now and then of some basic truths: Aging is natural. My Nexus 7 can't save me (even when connected to wi-fi). And to stop critically evaluating the world around me would be a sort of living death. As always, I welcome your comments here or on Goodreads or Facebook. 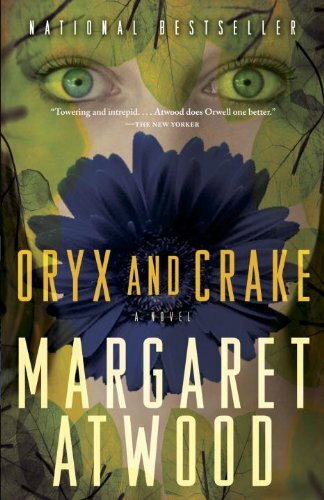 What did you think of Oryx and Crake? How do you think it compares, in both style and substance, to the other books in our Challenge? Join us next Sunday for Week 10 of the Summer of Sci-Fi Challenge, when we'll be discussing Natural History by Justina Robson, the second female writer on our list. Only three more books to go!